The lowest previous SIE in the IJIS JAXA record since 2002 had been 4,254,531 sq km on 25 September 2007. The value for August 24 2012 is 4,189,375 sq km. JAXA has been apt to correct upward current day readings, and the latest melt day was 149,000 sq km. But still there is a fair cushion there. JAXA melting is still very rapid. Lucia is taking quatloo bets on the NSIDC average for September 2012. In the linked post, she's looking at some history, and wondering whether it will be a new record low. Her modelling so far isn't sure. I think there will be a new record. NSIDC, like JAXA, is low and dropping fast. So I drew some graphs to show some recent precedents. Firstly, just the conventional full year plot of NSIDC ice extent. I've used rainbow colors for the years, except for 2012 in black. Next, the same plot but for August and September only. I've marked the 2007 min September average. Now here is a plot with all years translated to match the August 16 2012 value (a few early years didn't have a Aug 16 reading and are omitted). Again the 2007 min value of 4.28 million sq km is marked, although it hasn't been translated. The idea is to show that the melt from hereon, if following the path of earlier years, would generally go well below 4.28. The exceptions are years before 1995, when there was much less melting overall. And finally, here is a plot of the September averages, again offset as if each year was starting on Aug 16 from the 2012 value. As you see, if 2012 were not below 4.28, it would be an outlier relative to recent history. None of which, of course, says that a record is certain. I've added to the table at the ice/temp update page. It now includes the 2012 NSIDC numbers from here. They are on the right, in purple (h/t Neven). NSIDC doesn't update as promptly as JAXA, so I've just put the total following the last day's difference reading. NSIDC also seems to be noisier. However, both are showing rapid melting currently. JAXA stands at 4.664 m sq km, only about 0.4 m above the record 2007 low, and it has lost 0.377 m sq km in the last three days. The NSIDC index is showing a similar situation. GISS showed a global temperature anomaly drop from 0.56°C to 0.47°C. The June figure was also adjusted down a little from my earlier post, so that makes a total GISS drop of 0.19°C in two months. TempLS dropped only 0.05°C in that time. Both NOAA and HADCRUT were even steadier from May to June, so it will be interesting to see what they say this time. The satellites also diverged, with UAH down like GISS, while MSU-RSS was similar to TempLS. Update - NOAA has posted, down 0.019°C. 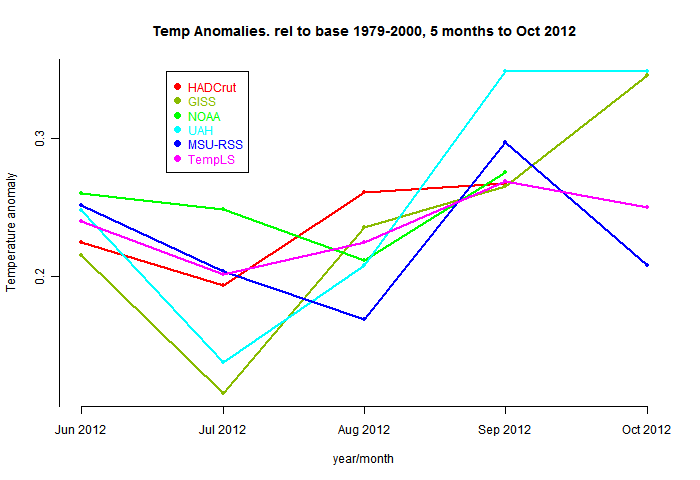 NOAA and TempLS have tracked very closely in recent months. The TempLS analysis, based on GHCNV3 land temperatures and the ERSST sea temps, showed a monthly average of 0.47°C for July, down from 0.5 °C in June. This was a similar change to the previous month. There are more details at the latest temperature data page. Below is the graph (lat/lon) of temperature distribution for July. I've also included a global interactive map of station temperatures. There has been publicity about NOAA's declaration of July as a record hot month for the contiguous USA - you can magnify to see the GHCN station readings there. Next is the interactive plot, with some brief usage guidance below.